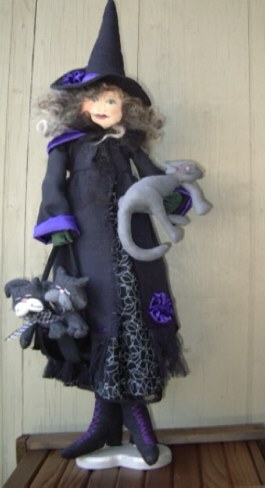 Franny and her Cats by Elaine LeGros, 33" tall! WOW!!! Uses a 1/2" x 48" wood dowel, 1/2 yard of fabric for dress, to help you visualize the size! Ester is 32"s from the top of her hat to the tip of her toes. An absolute gem of a witch . She is truly one-of-a-kind and I know you will thoroughly enjoy making her. 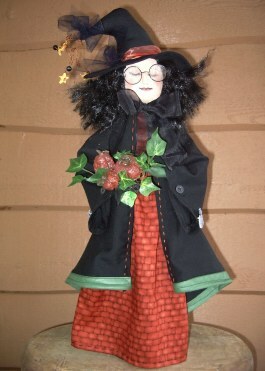 Her outfil is just full of detail right down to the pumpkins adorning her hat. Instructions included..
2 1/2" black buttons for coat sleeves. 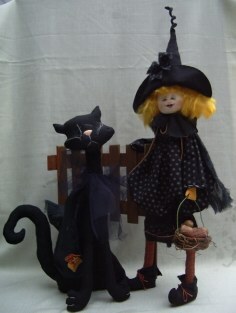 These two are a great pair, and will certainly add a lot to your Halloween decor. Agnes(25") and Aug (17") are both stand alone. They are standing beside a tall wooden purchased fence. Penny is a really fun witch to make. She sits on her own stoop offering a bowl full of pie pumpkins to anyone walking by. (Instructions included.) Her sitting height is 14". 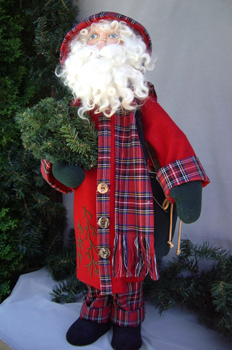 She would also look great sitting on your Thanksgiving Table by just changing her outfit colours to fall. 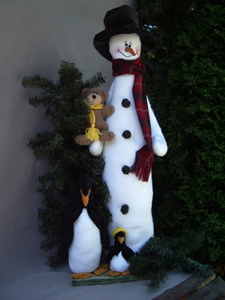 Sam the Draft Stopper - made to fit standard doors - nothing like a snowman to keep out the draft! 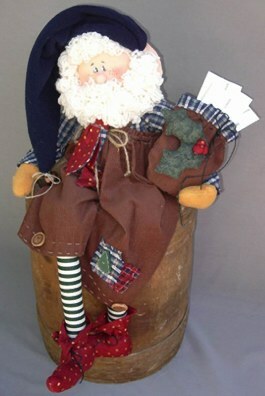 Goe Reindeer - 14" in sitting position - includes nose and a set of eyes with pattern. 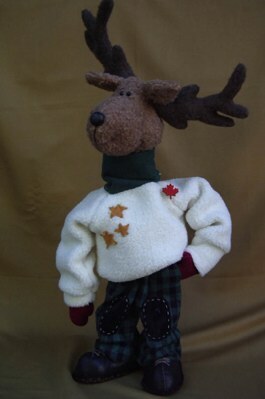 Price $12.75 ppd in the U.S.
Wilbert Reindeer 22" free standing - includes maple leaf, eyes and nose! 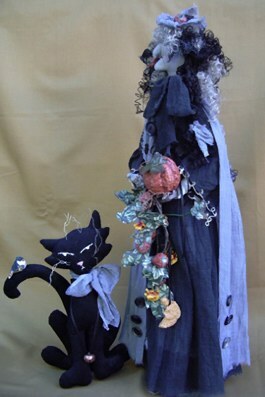 This elegantly ugly witch has just walked down the aisle, her only guest was her cat 'Snarl'. 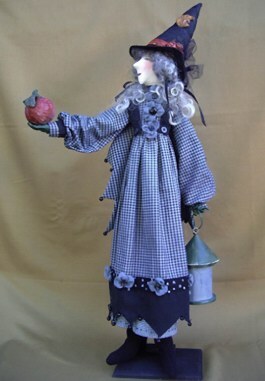 Her gown is made from dyed gauze and her bouquet has many paper mache pumpkins (how to instructions are included). 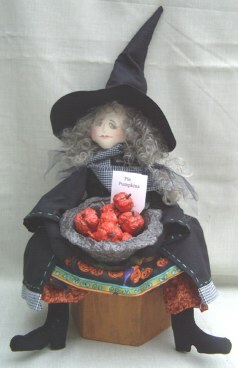 This is a very fun witch to make, she certainly is an attention grabber. 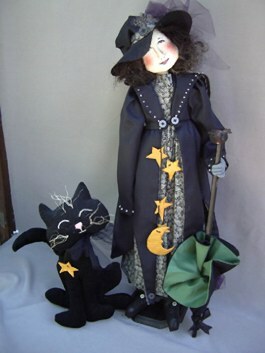 Walking with My Cat This lovely 25" witch is taking a stroll through the park with her pet "Cat". Her umbrella is very easy to make, yet adds that special touch. Her accessories are made from 'air dry clay' and instructions are included. 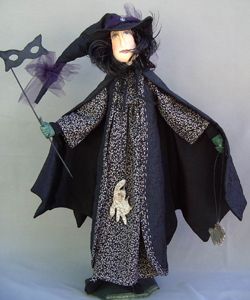 Price 12.75 ppd in the U.S.
Masquerade Party - with bat winged coat! 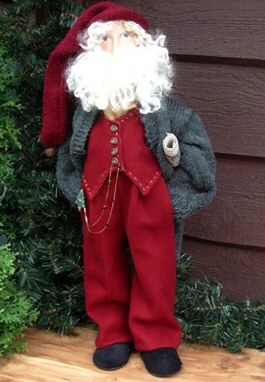 Size: 26"
Guy Scarecrow 25" would make another great addition to your Fall and Thanksgiving decor. Guy is free standing. He is resting one elbow on the welcome sign and as you can see one leg will bend - what a relaxed character he is, not a care in the world. At the base of the bird house is a pile of paper mache pumpkins (instructions included).